Kettering Games Club was started in early 2003 by a number of friends who had recognised that there was no gaming clubs in the area whether for role playing, playing board games or wargaming. Their collections were only gathering dust and so it was time for action. With an initial risk of £40 the club was started. Now, more than nine years later, the club is still going strong. 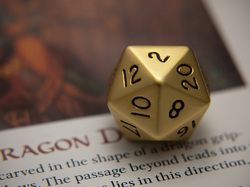 We have seen just about every sort of game played from collectable card games to obscure boardgames. If you're at all interested please get in touch as new members are always made to feel very welcome.